The Highgate Vampire is a story that has been popular for generations. It is believed by many that the Highgate cemetery was haunted by one or more vampires throughout the 1970's. Sean Manchester and David Farrant are the two individuals that are attributed with spreading the news of the Highgate vampire. During the year 1970 both men claimed to have encounters with an entity that they believed was of supernatural origins. In an interview that Manchester gave in February 1970, he stated that he believed the figure he had seen to be that of a medieval nobleman whose remains had been transferred to the area in the beginning of the eighteenth century. This nobleman was buried on the grounds that would later become the Highgate cemetery. He had been reported to have practiced black magic and Manchester believed that the Satanists practicing in the area during the late 1960's had aroused the "King of Vampires." While Manchester in subsequent interviews stated that the "King Vampire of the Undead" was a phrase coined by a journalist trying to make the story more interesting, he did speak of the eighteenth century nobleman as part of his personal theory in the version of his book from the mid eighties. Manchester's original interview had a side note from the paper that stated his stories could not be backed up and had no physical proof to go with them but just a week later the same paper used comments from Farrant regarding dead foxes as possible collaborative proof. David Farrant stated in interviews and within a book that he authored in 1991 that he spent the night in the Highgate cemetery on Christmas Eve of 1969 and that during his stay he had seen a grey figure that was not human. This figure according to Farrant had two red glowing circles where a human‘s eyes would be. Farrant did not conclusively state that what he had seen was a vampire and changed his terminology during different interviews. He would sometimes state that it was a ghost, specter or other unexplainable phenomenon. He did at times speak of it as possibly being amongst the vampires that were wandering the earth. In articles posted on David Farrant's website he describes his experience as having "felt like he was being watched and then seeing a tall figure, approximately eight feet high that was dark and had glowing red eyes". He felt as if this figure was draining him of all his strength and required time to re energize afterwards. His subsequent investigation immediately caught the attention of media and the curious around the world. He felt as though many of the information and tales that came after his were more imagination based and even those that did have some truth to them were exaggerated to ridiculous proportions. 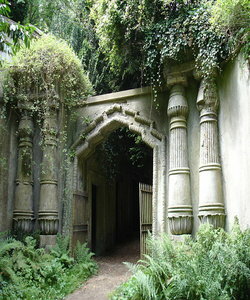 Manchester and Farrant were not the first to claim to have seen vampires or strange occurrences in Highgate cemetery. There were two episodes that were documented in 1967, up to three years before Farrant or Manchester started their search for the Highgate Vampire or brought such publicity to the stories. One of the accounts given in 1967 was of two young ladies walking home past the cemetery when they reportedly saw "bodies rising from the graves." One of these sixteen year olds complained that she was visited on many occasions at night time and even experienced blood loss because of the vampire's visits. The second account of the Highgate Vampire was reported by an engaged couple that were walking down the same path as the girls just a few weeks after. They are said to have seen an evil spectral figure that paralyzed them with fear when entrapped in its gaze. There are many reports of dead animal bodies being sprawled throughout the Highgate cemetery. Some of these accounts say that the animals had no visible sign of how they died while others state that the bodies were drained of their blood and had vampiresque wounds on their necks. Of all the haunting tales and vampire stories available the Highgate vampire has been debated and believed more than any other. There are no real answers given but true believers in the existence of vampires will most certainly use the Highgate Vampire as a story with some merit.